Seems unlikely that CW will renew this show - I really wish it had been designed as a limited-run event so they could end with the present-day father/daughter reunion instead of having to leave themselves something for a theoretical season 2. Since there was never any real question of Jules' death not getting prevented, her rescue felt kinda anticlimactic (and now Gordo has a dead dad? I never warmed to the character, but, still, bummer choice, writers). I knew from the pilot that I was probably going to get cliffhanger-ed or unfulfilled be the finale, so, this just left me with a kind of 'well, darn' feeling. Well, once you destroy the magical ham radio, you really can't have a show any more. They were obviously planning a second season, but frankly I'm not sure it would work... Let's chase the same killer for another season! I was disappointed by this one. First Raimi gets her Back-to-the-Future-style Much Better Future (Mom's alive! She's a doctor! Gordo is a lawyer! Captain Boring is her fiancé again!) but we're stuck with the same creepy guy wandering past the house. Also some of the drama was weak. Like Boring Fiancee asking her about her mysterious Ham Radio friend and she has to give him a weird "you have to trust me" speech instead of just saying "There are other bored people out there with radios. Sometimes we chat." And she's worried about telling him the truth because she thinks it will change something... that's faulty time travel logic. She's in the present. Telling him that could change her future, yes, but everything she does every day is changing her future. I would have liked a weirder ending: Due to the events in the past Raimi finds that Gordo's a successful lawyer but she washed out of the force a few years ago and got a job as a 4th-grade teacher. And she's married to Cop Guy but they fight constantly. And she lives in Omaha. Something really different for her to try to figure out. Or... let's just have the ending from the movie. It would have worked perfectly in this episode: they talk about his death in a traffic accident, Frank goes out and buys the safest car money can buy and takes a defensive driving class, and just as the killer is about to attack the Sullivans in the present, Old Frank appears and shoots him. Oh well... this show bit off more than it could chew but it sure had potential. I'll still watch if they do a Season 2. But it seems unlikely. What a letdown of a show. I agree that a miniseries would let the writers plan the arcs better. Monochrome, did you just Netflix the series? I never bothered to watch the epilogue the CW put out back in May, but I was curious if it got included in the Netflix season. 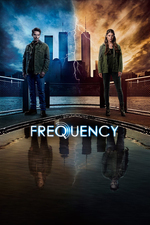 Per the article "the Frequency one is a slightly expanded version of the original finale, but with a new scene where Peyton List’s character passes back one last bit of information to her father". Yes, I just binged it. I didn't know there was an epilogue: Netflix leaves it at Robbie peeping on the house. Thanks for pointing out the epilogue. It was nice to see the expected reunion even if they had to basically say "happily ever after" in three minutes. Hey, thanks for letting me know about the epilogue! Not the best but at least it was a better ending, and iTunes didn't include it either.